This graphic novel really struck a chord with me. While they call the city Bahia de la Luna they might as well have said "Crecent City" because the town is almost the same, down to a tea. Fog cloaked, tiny, and with an air of abandonment and magic the child main character, Cat, navigates this strange city while negotiating emotional, cultural, and magical issues. This novel deals with some serious issues, one of which is the illness of Cat's sister, Maya. This novel had a bit of a slower start than I had expected and also addressed issues I didn't expect. 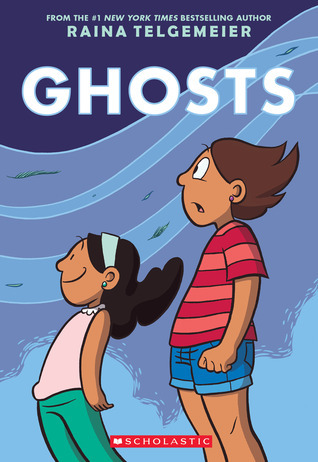 There were some rich cultural references to Hispanic (specifically Mexican) and it also dealt with the death in an interesting way, both with the "ghosts" in the town and also Maya's plight with cystic fibrosis. I think there were many "hints" in as to what will happen to Maya but I did like that, while they dealt with Cat's feelings on the issue, they didn't expressly state what happens to Maya in the book. I recommend this novel, though I would make sure your child is ready for the issues it deals with in the storyline. I would also encourage readers (or their parents) to stick it out, it does get going after a slow start. And for those middle grade parents who are reading this: There is no swearing, sexual content, or substance use. Lovely, cultural rich book that deals with teen issues of death, displacement, and emotional growth. It's a little slow to start but it's worth the read. While it deals with important issues it does not contain anything inappropriate for a 10-12yo.